Connecting to multiple networks with the same laptop can sometimes be a very frustrating thing to do, especially because most networks use different configuration settings. But Free IP Switcher is here to help, offering a very fast solution for quickly changing network configuration. The idea it is based on is pretty simple: Free IP Switcher lets you configure up to five different configuration profiles for the same network adapter. Every time you connect to a specific network you can enable the appropriate profile, which means that you save a lot of time because you don’t need to manually input the settings. Of course, you have to know the IP address, subnet mask and default gateway, but also the DNS servers in case the computer doesn’t obtain the DNS server address automatically. 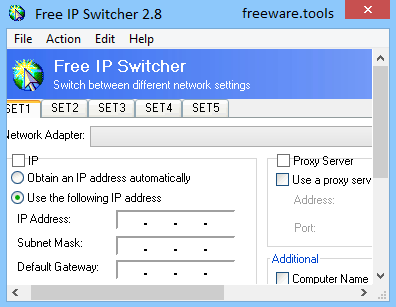 What’s more, Free IP Switcher lets you specify a computer name and a workgroup, choose a default print, set up a proxy server and define WINS server. There are no other options, but the problem is that Free IP Switcher lacks some important features, at least when comparing this app with the other ones on the market. For example, it doesn’t come with hotkey support, which could be pretty useful if you’re trying to change the used network profile on the fly. The good thing however is that Free IP Switcher runs smoothly on all Windows versions without any impact on system stability. Administrator privileges are required on Windows 7 workstations. To sum up, Free IP Switcher could come in handy to many users out there that connect to more than one network on a regular basis. It’s pretty easy to use and it comes with the essential options exclusively.